This Fashion Friday post is for the Shoeaholics out there who live in New York!!! For one day ONLY (this Sunday), more than 400 shoes from Louboutin, Gucci, Nicholas Kirkwood, and so many others will be $150 or less. 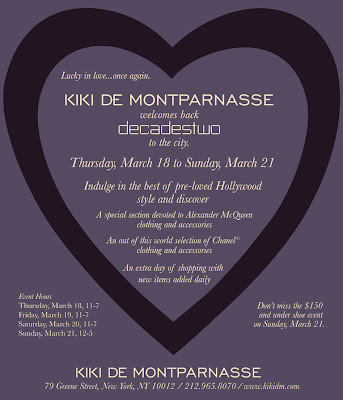 The event will be held at the Kiki De Montparnassee store 79 Greene St., b/t Broome & Spring Sts. (212-965-8150‎) from Noon-5pm. If you are interested, make sure to get there early because, as always, the good stuff goes fast. See you all there!